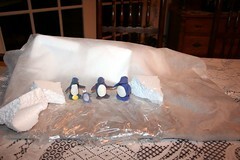 So in honor of all the fallen penguins, devoured by hungry grandmothers everywhere, my nephews and I made dioramas. Dioramas? My family played Scrabble…not nearly as productive. Oh my god, we watched March of the Penguins on Thanksgiving too! Only we weren’t nearly as creative as you or your grandmother. We just sat there feeling sad until it was time to drive home. I had never thought about eating penguins before either. I’m going to guess they’d be very fatty, and maybe a little like duck? We have Penguin chocolate biscuits in the UK, I don’t know if you have them over there… but still never thought about eating an actual penguin. Now I can’t stop. I love the dioramas, and also thought the icebergs were very clever… although clearly not as difficult to create as the beautiful penguins (roasted with lemon and thyme and served with mashed potatoes?). Your grandmother is so cool. I’ll bet she was pulling your leg. laurel: thanks! 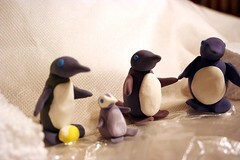 and yes, penguins were the last thing i wanted to eat at that moment. 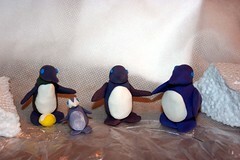 pumpkin pie, maybe, but not penguins. robin: i think my option used less brain power, though. cheryl: wasn’t it just so depressing? i couldn’t handle it when the one penguin tried to steal the other baby. serap: i’ll bet they’re very fatty, unless you eat the males after they’ve been caring for their eggs for 4 months. then they’re lean and stringy. roy: you know what? i think you’re probably right. but she does like to eat! average jane: omg – i’m totally making those! That is so something my granny would ask while chewing all mush-mouthy and staring off into space. Are all grandmothers the same? A superb depiction of the lives of penguins. Cute!! More productive than the Candyland game I played with my cousin’s daughter, which resulted in having little colored Gingerbread people thrown at my head. you made dioramas. that’s awesome. anon: i crack up every time i look at me in those glasses, too. kilax: on many levels, yes, i think they are. so soon enough, i guess we’ll all be thinking about eating penguins. rhea: it’s a rough life. i think there should be penguin rebellions. diane: ugh… candyland really brings out the worst in people, doesn’t it? sizzle: see – you have that to look forward to with your nephew in a few years. God, I’m a terrible aunt — I just taught my niece how to lay down in a way that makes full stomachs hurt less. old people are enigmatic. that’s my story, anyway. sandra: somehow, i think your advice is far more practical. brandon: funny. my great great great great grandfather used to say the same thing about dodo bird. said you never did taste any meat quite as tender. god, those were the good old days. Only 4,000 calories? Awwwwww Jenny, couldn’t you have just asked for help? I’m sure we all would gladly pitch in to help your family at the holidays, to ensure you the customary Thanksgiving portions of 10,000 calories per person. I never thought about eating a penguin before — but now that you mention it I bet they’d be great cajun style. Thanks for the idea, Jenny’s Grandma! When my girls were younger and I got bored on holidays, I taught them how to play poker. I’m a terrible mother. geez, i’m proud when i play dinosaurs or read a book to my nephew. you, on the other hand, are creatively awesome! Enormous buffalo style wings is what I’m thinking. shari: well, i wasn’t counting the pumpkin cheesecake and chocolate cherry brownies my mom made… that probably pushed me closer to 9500.
vahid: ooooweeee i loves me some cajun penguin! churlita: i think the skills you taught them will serve them well in life. hilly: hee – thanks! it was either that, or listen to them tell me about medieval weapons and yugi-oh for another 4 hours. tracy lynn: actually, their wings are pretty tiny. but a penguin rump roast might be tasty!